Shhhh…..I’ve got a secret. 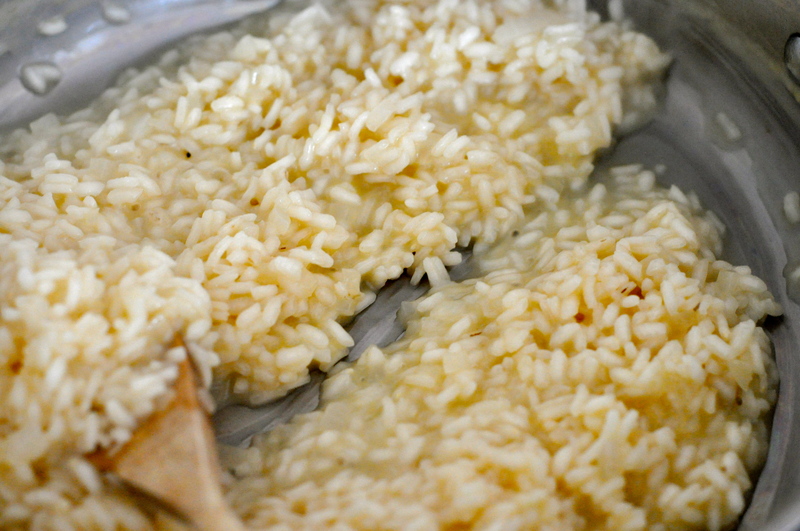 Risotto is really not hard to make. It’s easy! If anyone tells you different they are sandbagging. 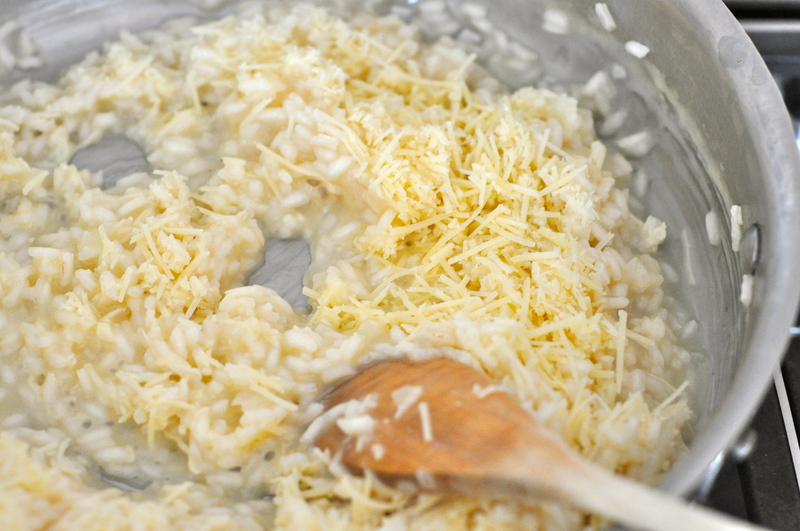 Parmigiano-Reggiano Risotto is basic and classic and oh-so good just as its perfect self. But…. (drum roll please)… once completed you can add in any number of other goodies to the creamy rice like caramelized butternut squash or grilled lemon shrimp to take it up a notch. But let’s save those risotto recipes for another day. 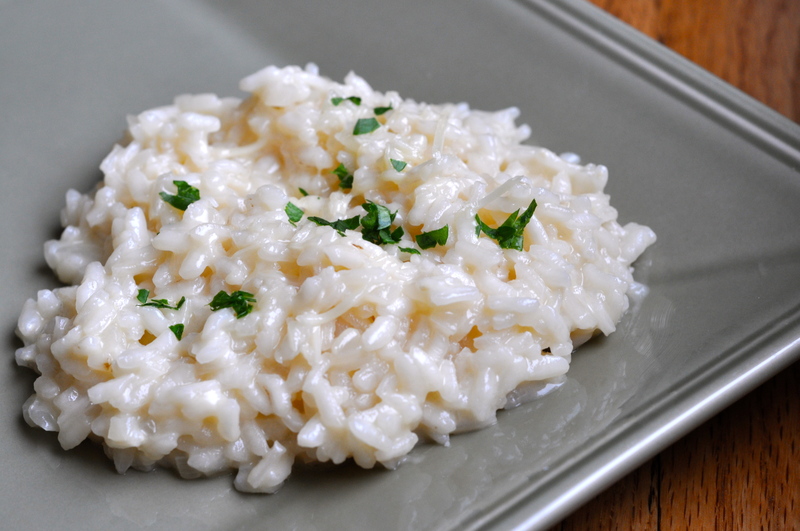 Today is all about never letting basic risotto technique intimidate you again! Empty the chicken stock into a sauce pan and heat it up to a simmer. Reduce the heat to low and keep the stock warm on a side burner. We will use it in a minute. 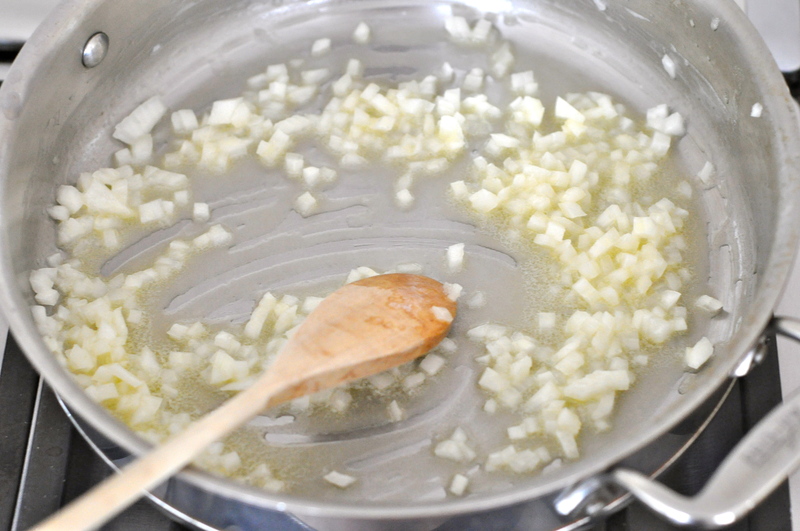 In a separate large saute pan melt the butter and add the diced onions. Cook over low heat for 8-10 minutes until onions are translucent and soft. 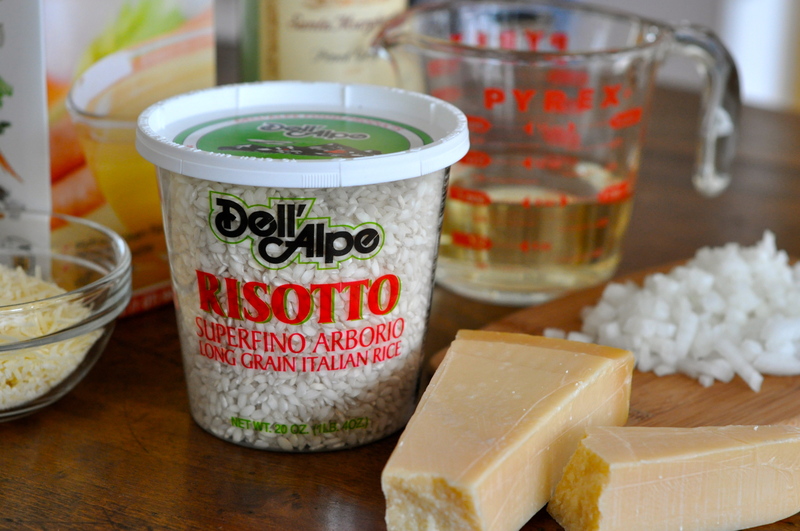 Unless you can get your hands on Italian risotto Aborio rice don’t attempt this recipe. Look for it in the specialty Italian aisle at the market. Add the Aborio rice to the onion mixture and saute for 3-4 minutes. 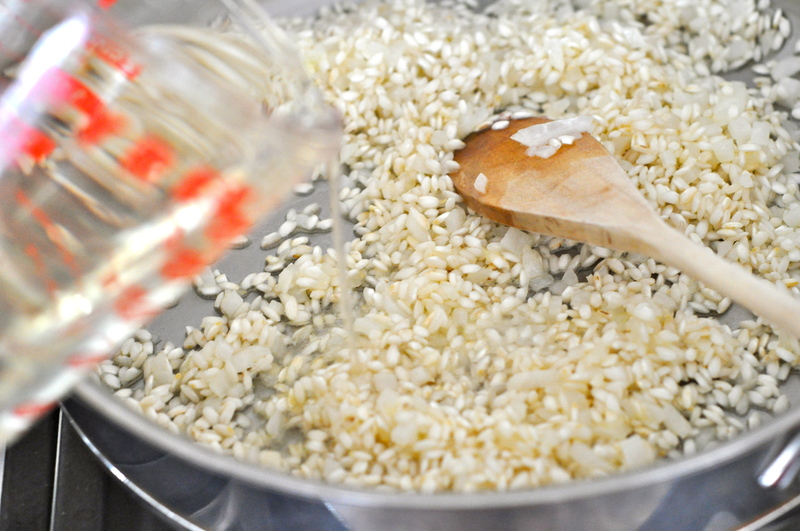 Sauteing the rice kernels first is a very important step and activates the starches in the rice to cook properly. 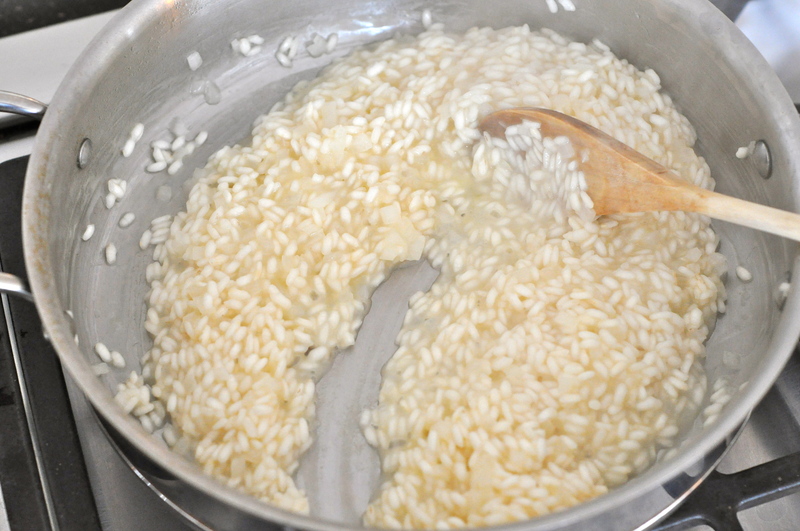 If you don’t saute the rice first your final risotto will be mushy. After the rice has sauted for 3-4 minutes add the white wine. 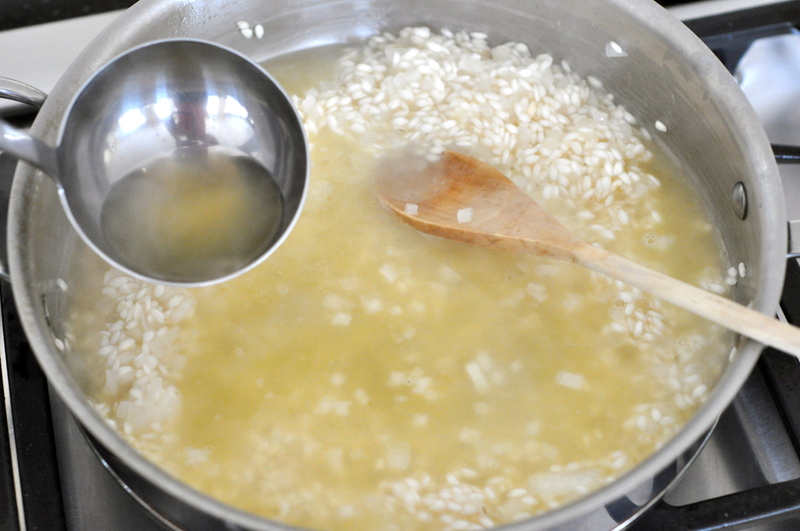 Cook over medium heat stirring frequently until the rice absorbs all the wine which will take 2-3 minutes. Next add two cups of the hot stock. Simmer stirring occasionally until rice absorbs all the liquid. This will take about 8-10 minutes. Repeat this method of adding hot stock and cooking the rice until it absorbs all the liquid twice using two cups of hot stock each time. 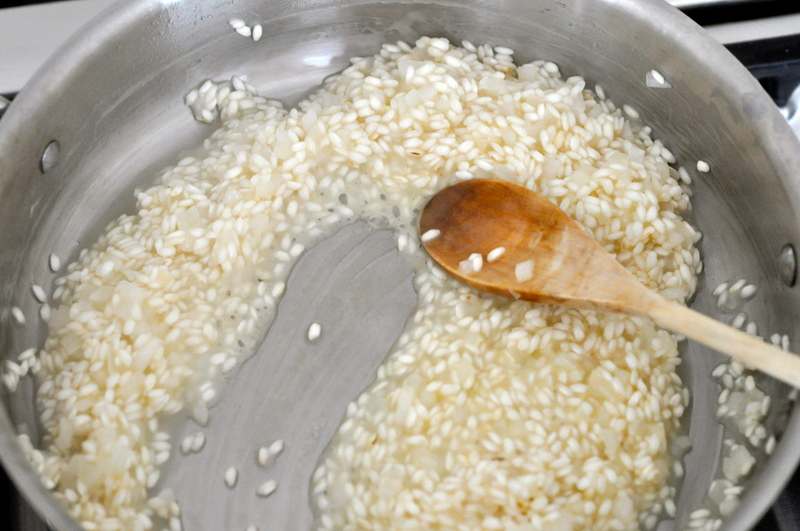 If you happen to use up all the stock and the mixture is still too thick (or maybe the rice has not cooked all the way yet) no worries – just add a little hot water until you get the consistency you want. Visa versa, if the mixture is too runny just cook it a little longer until the liquid is absorbed. It should look like this when finished cooking. 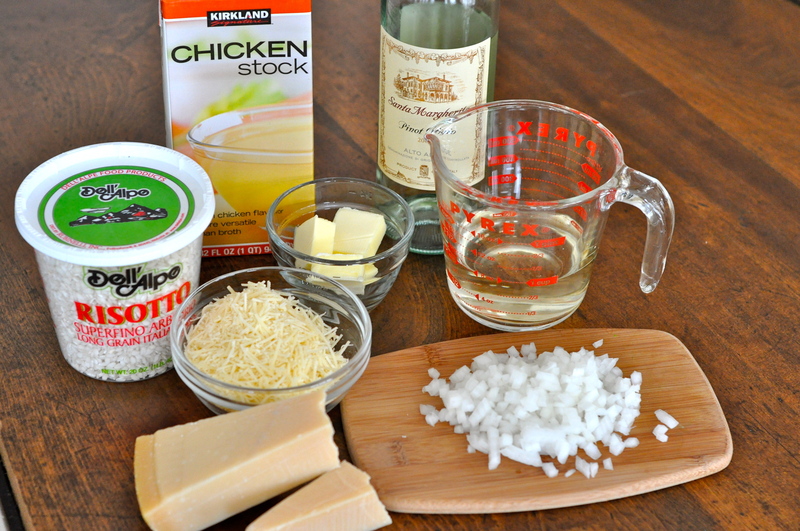 Take it off the heat and stir in the grated Parmigiano-Reggiano. Salt and pepper to taste. Serve immediately. This Carb Queen thanks you for all the fabulous tips! I hereby solemnly swear to relinquish my irrational fear of risotto. Cathy you are right. Risotto it’s so easy to make. I learned the basic recipe watching Ina Garten. I have made wild mushroom risotto, lobster risotto. My favorite is parmigiano and lots of butter topped with grilled shrimp and diced tomato salad on top with lemon juice and lemon zest. I make it like once a month. Thanks for sharing. Yours looks delicious. Thanks Ces!! I think we are twins separated at birth…I love Risotto too!! Wild mushroom finished with truffle oil is my favorite. Yum! I can’t think about risotto without recalling Gordon Ramsey chewing people out about it on Hell’s Kitchen. It can’t really be that hard to make, can it?